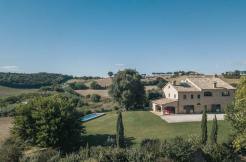 Farmhouse Casale dell’Angelo is immersed into the stunning countryside surrounding Jesi, with several outbuildings and a beautiful garden and a large carpark. 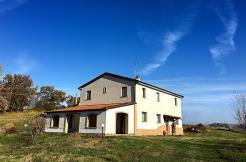 Farmhouse Casale dell’Angelo is spread out just like a small village, the main house covers a surface of 400 square meters over two floors, with six bedrooms and four bathrooms, a large hall with fireplace, a large kitchen, laundry room and storage closet. The second building is a sole glazed room with a A-frame roof (beams and tiles) over a surface of 40 square meters. The third building is composed of a bedroom with bathroom and small sitting room. The fourth building covers a surface of 60 square meters and is an outbuilding to be restored. The garden is 8000 square meters large, mainly flat. The road is very well kept. Water, eletcricity, LPG heating system with radiators. The nearest town is 2 km far. The city of Jesi is 5 km far. The sea is 30 km (The shores of Mount Conero).